I read an interview with Tom Dixon the other day, where he was asked to describe himself in five words. He used up three of his words, saying he’s “lucky, lucky, lucky” – and that’s how I feel too! At the end of Feb, I got an email from Selvedge Magazine, telling me I was the lucky recipient of one of the 50 free online subscriptions they were giving away! Wowee! Now I just log in at Exact Editions and read the current issue (pic above), as well as back issues of this amazing textiles mag. You can get a free trial version of Selvedge at Exact Editions too. Check it out. Oh my! Congrats:) I adore Selvedge. I have been a collector of that amazing mag for a while! My subscription just ran out though:( I think you need to be featured in there! Ah, that illustration is driving me nuts! I know I’ve seen it somewhere – any idea who did that? Thanks rikkianne and Sam. I think i’d fall over in a faint if they wanted to put my stuff in there! Sam, the illustration is a papercut by Rob Ryan. He’s got lots of work out there, and a blog too. Google him – you won’t be sorry! I am so jealous. Selvedge is a beautiful magazine, but just doesn’t fit in my budget right now. Enjoy! Fantastic, congrats on the news. 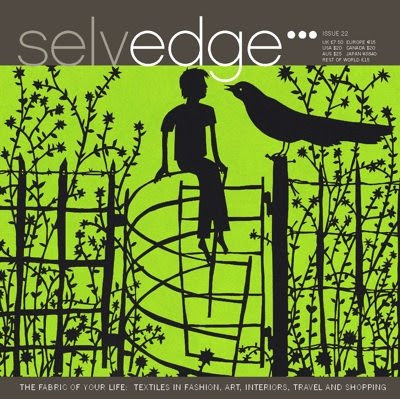 Selvedge mag is to swoon for, look forward to new inspiration.